Western blot analysis of mouse, rat, and human brain extracts using AQP4 (D1F8E) XP® Rabbit mAb (upper) and β-actin (D6A8) Rabbit mAb #8457 (lower). Immunoprecipitation of AQP4 from human cortex extracts. Lane 1 is human cortex lysate immunoprecipitation, lane 2 is Rabbit (DA1E) mAb IgG XP® Isotype Control #3900, lanes 3 and 4 represent 1:50 and 1:100 dilutions of the immunoprecipitation of human cortex lysates. 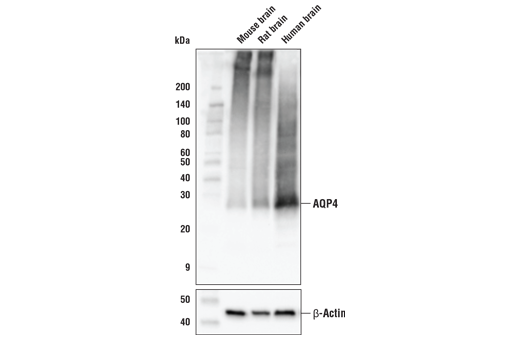 Western blot analysis was performed using AQP4 (D1F8E) XP® Rabbit mAb. 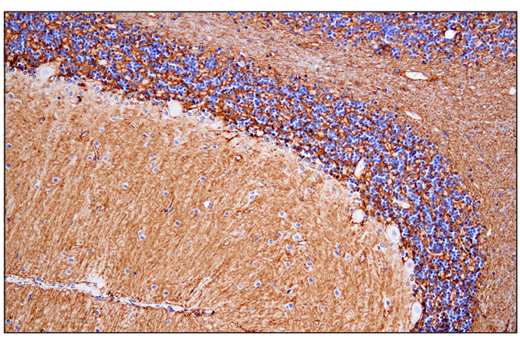 Immunohistochemical analysis of paraffin-embedded human cerebellum using AQP4 (D1F8E) XP® Rabbit mAb. 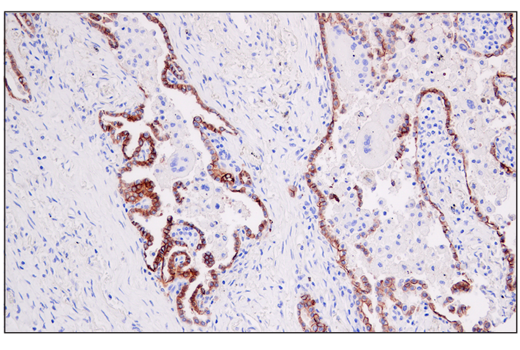 Immunohistochemical analysis of paraffin-embedded human squamous cell lung carcinoma using AQP4 (D1F8E) XP® Rabbit mAb. 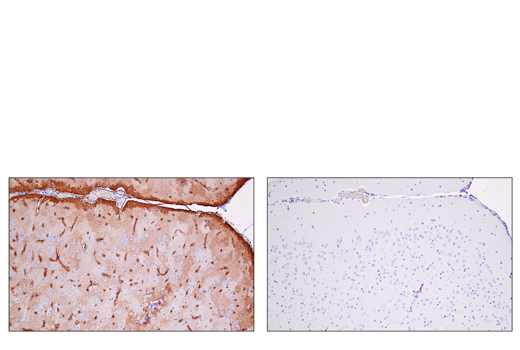 Immunohistochemical analysis of paraffin-embedded mouse brain near third ventricle using AQP4 (D1F8E) XP® Rabbit mAb (left) compared to concentration matched Rabbit (DA1E) mAb IgG XP® Isotype Control #3900 (right). 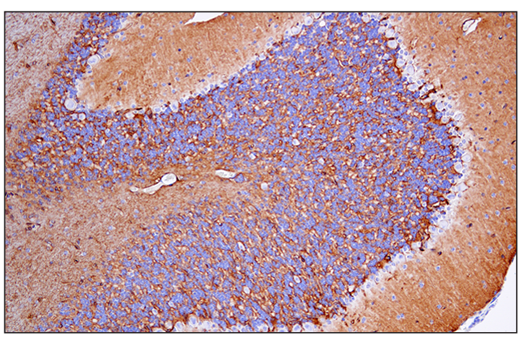 Immunohistochemical analysis of paraffin-embedded mouse cerebellum using AQP4 (D1F8E) XP® Rabbit mAb. 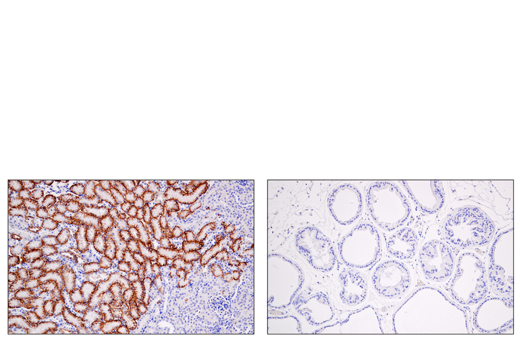 Immunohistochemical analysis of paraffin-embedded mouse kidney (left, positive) and mouse prostate (right, negative) using AQP4 (D1F8E) XP® Rabbit mAb. 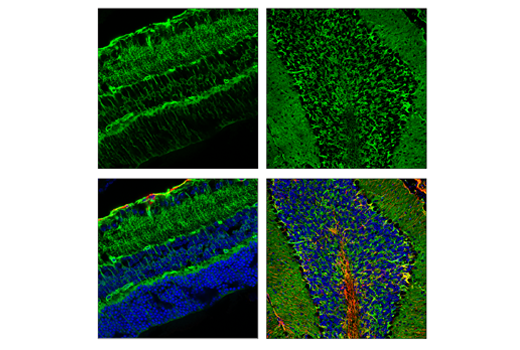 Confocal immunofluorescent analysis of mouse retina (left) and mouse brain (right) using AQP4 (D1F8E) XP® Rabbit mAb (green) and GFAP (GA5) Mouse mAb #3670 (red). Samples were mounted in ProLong® Gold Antifade Reagent with DAPI #8961 (blue). 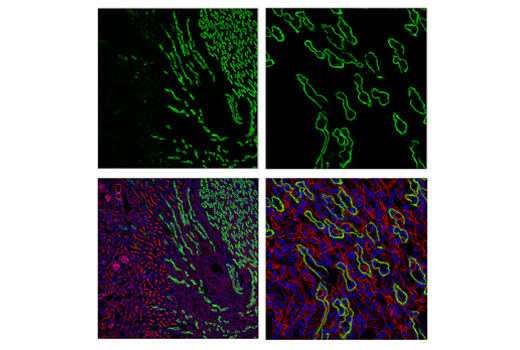 Confocal immunofluorescent analysis of mouse kidney using AQP4 (D1F8E) XP® Rabbit mAb (green). Actin filaments were labeled with DyLight™ 554 Phalloidin #13054 (red). Samples were mounted in ProLong® Gold Antifade Reagent with DAPI #8961 (blue). 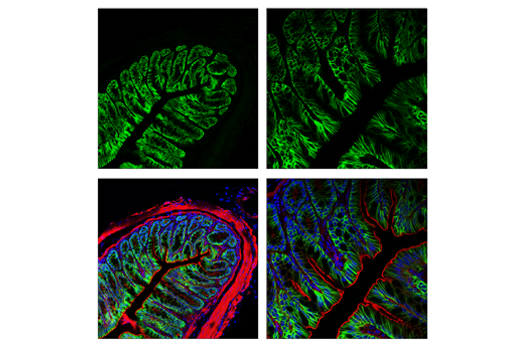 Confocal immunofluorescent analysis of mouse colon using AQP4 (D1F8E) XP® Rabbit mAb (green). Actin filaments were labeled with DyLight™ 554 Phalloidin #13054 (red). Samples were mounted in ProLong® Gold Antifade Reagent with DAPI #8961 (blue). 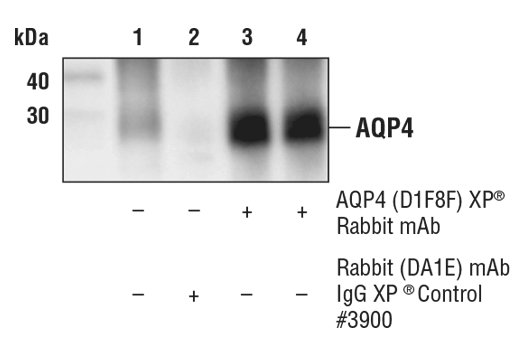 AQP4 (D1F8E) XP® Rabbit mAb recognizes endogenous levels of total AQP4. Monoclonal antibody is produced by immunizing animals with recombinant protein specific to the carboxy terminus of human AQP4 protein. Aquaporins (AQP) are integral membrane proteins that serve as channels in the transfer of water and small solutes across the membrane. There are 13 isoforms of AQP that express in different types of cells and tissues (1,2). AQP1 is found in blood vessels, kidney, eye, and ear. AQP2 is found in the kidney, and it has been shown that the lack of AQP2 results in diabetes (1,3). AQP4 is present in the brain, where it is enriched in astrocytes (1,2,4). AQP5 is found in the salivary and lacrimal gland, AQP6 in intracellular vesicles in the kidney, AQP7 in adipocytes, AQP8 in kidney, testis, and liver, AQP9 is present in liver and leukocytes and AQP10-11 in the intestine (1,3,4). AQPs are essential for the function of cells and organs. It has been shown that AQP1 and AQP4 regulate the water homeostasis in astrocytes, preventing cerebral edema caused by solute imbalance (5). Several studies have shown the involvement of AQPs in the development of inflammatory processes, including cells of innate and adaptive immunity (6,7). AQP4 is expressed in brain cells, including neurons, but enriched in astrocytes, as well as in the peripheral nervous system (4,7). AQP4 influences synaptic plasticity and the lack of this protein in the brain may cause memory and learning impairment via glutamate transporter 1 (GLT1) in Alzheimer's disease (8,9,10). It's suggested that AQP4 could play a role in the clearance of β-amyloid, and it may influence the transport of potassium and calcium in Alzheimer's disease (8,9). In Parkinson's disease, the lack of AQP4 results in an increased susceptibility of neurons from the substatia nigra and the ventral tegmental area for MPTP (11). Takata, K. et al. (2004) Prog Histochem Cytochem 39, 1-83. Echevarría, M. and Ilundáin, A.A. (1998) J Physiol Biochem 54, 107-18. Gomes, A. et al. (2018) Front Chem 6, 238. Xu, M. et al. (2017) Adv Exp Med Biol 969, 81-103. Kobayashi, H. et al. (2004) J Pharmacol Sci 96, 264-70. Meli, R. et al. (2018) Front Physiol 9, 101. Ishibashi, K. et al. (1998) Biochem Biophys Res Commun 244, 268-74. Hubbard, J.A. et al. (2018) Brain Res Bull 136, 118-129. Lan, Y.L. et al. (2016) Neural Plast 2016, 4626593. Lan, Y.L. et al. (2016) Mol Neurobiol 53, 5300-9. Zhang, J. et al. (2016) Neurosci Lett 614, 7-15.